Colorless, moisture-proof film molds to surface. Stretch film tight to seal beakers, flasks, tubes, and Petri dishes. Order a dispenser separately above. 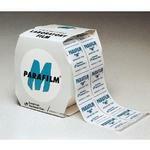 Parafilm is a registered trademark of American Can Company.